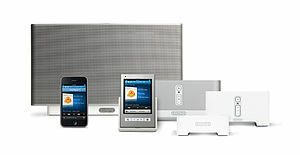 New info from Strategy Analytics reports that Connected Home Audio Devices sales will top $1 billion this year. Total unit sales grew by 57% in 2010 to 3.3 million. Total active, installed units was 7.4 million by the end of 2010, but there’s still plenty of room for growth in that number. The report summary reports that the total active installed base is expected to exceed 40 million units by 2015. Typical customers are young and male, similar to buyers of other electronics products. Current pricing in the category of Connected Home Audio Devices is to high for it to become a mainstream product category, but growing competition in pricing should drive the price down and sales up.